It all started with an e-mail from Ivan Man Dy (Yup, the dude who ate fish balls with Anthony Bourdain of No Boundaries)inviting me to an afternoon of Presidential treats. Ivan is the man behind Old Manila Walks and he is relaunching the tour 'Power, Palace and a SHOT of Beer! - a walking tour around Manila's historical places. So after several returns of emails with Ivan and exchanges of texts with travel-bud Dong Ho, I hopped on a bus one early Saturday morning from Cabanatuan and headed straight to Manila to join the Walk. The meeting place was in Legarda Mansion (La Cocina de Tita Moning)where I have met fellow Travel Bloggers Ferdz, Oggie, Nina, Eric and Dong Ho. There were also some Balikbayans and foreigners who will join us in the tour. Ivan came and gave few introductions. According to Ivan, the tour involve "leisurely stroll around the patrician district of San Miguel, making our way as we get intimate and admire the hollowed halls and the newly restored rooms of the Malacanang Palace Museum! In between, we'll rest our weary feet over a fine-dine merienda at the lovely 1930's Legarda Mansion a stone throws away from the Palace." So off to the Palace we go. After the usual security checks by the PSG where our camera are marked and our bags searched, we headed to the Malacanan Palace. It was in front of the Palace where Ivan started a historical journey about the story of the place from the time the Philippines was under foreign rule. Complete with cards and props, he articulately explained bits and pieces about Philippine history. It was at that time when we were informed that the President was inside the palace and that there is a very great chance that we will be able to see and meet her. And we did meet her face to face. For a good minute at least. Too bad, we are not allowed to take her pictures. But nevertheless, meeting her was such a good experience and we are one in saying that no matter how you dislike her, you cannot help but act properly in her presence because in that lone minute alone, everyone was smiling. This is the second time that I have been to the Palace. I remembered to have participated in Lakbay-Aral Tours when I was in Elementary School before but I really have no recollection of the place. But this time around, I have been given the chance to see the Palace up-close and walk in every room satiated with so much art from paintings to sculptures, from elegant furniture to crafty fixtures. As we walk from room to room, Ivan made sure that he brought us not only to the sights but the stories behind the sites as well. His storytelling is done in a very unconventional way bringing all of us back to the old Manila in an interesting albeit animated way. He mixes facts and chizmiz for which I really could not disclose the latter 'coz we might get in trouble for being hearsay's lol. 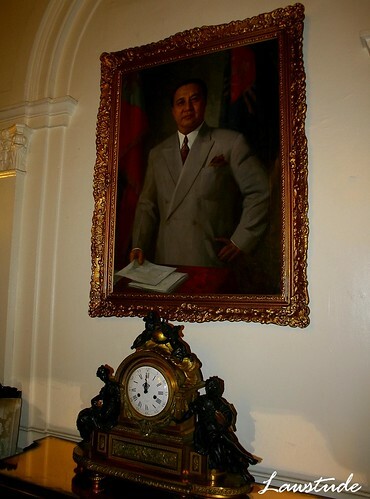 My favorite place in the Malacanan Palace is The Hall where the rosters, profiles and statues of all the Philippine presidents are located from Emilio Aguinaldo to Gloria Macapagal-Arroyo. There were also enclosed collections of mementos and articles that you can directly associate with each president. Surprisingly, there is a space amongst the Lines of President designated for Imelda Romualdez Marcos but don't expect to see her famous shoes there because those were transferred to a separate museum in Marikina. 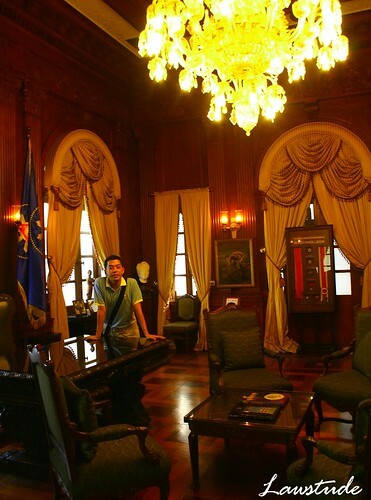 The tour around Malacanan Palace will take you approximately two hours (definitely more if you have your camera). As explained by Ivan, Malacanan refers to the Palace while Malacanang refers to the whole complex that included the Malacanan. For security reasons, some portions of the complex are off-limits to visitors. The "Old Manila Walks" is determined to walk and talk about one thing: the history, the culture and the heritage plus everything over, under, outside, inside the City of Manila. Ivan believes that the best way to explore Manila is by foot so they have taken this experience one step further! Old Manila Walks operates on a simple principle: to have you experience the best of historic Manila - one step at a time. It's a lure to an urban adventure, a cultural loop or just a plain simple exercise for your body and soul. There are several line-ups of "Walking Tours" that included the 'Power, Palace and a SHOT of Beer! tour which I have participated. To join Ivan and his Walking Tours please check out the Old Manila Walk Website or Ivan Man Dy's blog. and yeah! you shouldnt missed going to Bantayan Island especially in Sta Fe where long stretch of white sand beaches is at stake! Last summer i went there specifically Sugarbeach. It's Cebu's alternate to Boracay! I have still to discover Sumilon this coming Saturday. a tour that i will recommend! ivan is really good at taking us back to those times so significant to us filipinos. I've read the write-up of some bloggers. You've got an added approach and great photos, too. I joined one of Ivan's tours and he's really good. pards, siguro sa trabaho lang at sa mga likod ng gobyerno ako nagdadalawang isip sa presidente, in a whole at sa personal naman ay hindi. sabi nga nila trabaho lang at walng personalan.he he he. eniwey,iba ang dating ng pagkakapasok ng picture mo,gaya ng dati para akong kasama sa paglibot nyo,bawat angulo nakapglalakbay ako sa old manila..
di parin nagbabago yung aura,nung time na nakapasok ako dyan dahil sa pag-aaral namin sa mga old paintings. at isa sa mga pangarap ko ang makapaglagay ng pintura dyan,at gusto kong maging anonymous.salamat, daan naman ako kay kung may update din dito. How much is the tour? Ano mga kailangan na documents? Di pa ko napupunta jan eh. how come you and Dong got the invites (lol)? bakit kami, wala? wow, very lovely shots, ang gaganda lahat and I am so envious, i hope I get to visit the palace sometime soon too. 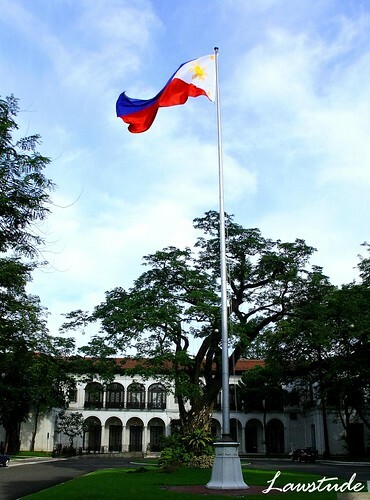 what a lovely edifice Malacanang is! one day we will visit there. Wow. I have never been to the Malacañang Palace so I really appreciate your feature about it. It is full of history that all of us must cherish. Keep it up Sir. saludo ako sa mga taong katulad nina ivan man dy at carlos celdran who are so enthusiastic about preserving and promoting our filipino heritage while making it kaanya-anyaya at the same time. Ang galing naman. Buti at na maintain nila yung place. Di ba napasok at nanakawan yan noong EDSA revolution? Glad its restored and still elegant. Good Shots and a Wonderful Experience. Been to Malacanang right after Marcos left but I don't remember a thing about the building anymore. I hope to visit the place again one day. ang ganda! i like it too. how much? Incredible tour. I would love to take this tour when I go back to visit. I believe that any place is best explored on foot. ngayon lang ako naligaw sa site mo, and I'm glad naligaw ako dito. This is an opportunity I would never miss if given the chance. Lucky you to have been invited! Hope uulitin ulit ni Ivan ang tour when I visit the Philippines next time. I really hope I could join in one of these tours. I have heard so much about Ivan and Carlos Celdran too and their mission about Manila. How much is the fee? What a huge and historic place to visit! ang galing! the next time I'll go to Manila, I'll ask you and dom about how to join walk tours ha? I'd been with Ivan Man Dy's Manila Chinatown tour sometime in 2006 and I agree, he's so witty with the unconventional way of telling about history. This is the tour I'd like to join. I've never been inside Malacanang (I'd been inside Malacanang perimeter but never been inside the buildings). Thanks for the tour. It's my first time to see the palace in its grandeur. Nung nag-aaral pa kasi ako, hanggang Mediola lang ako palagi. Ayaw akong papalapitin sa Malacanyang. Ewan ko kung bakit. To those who are asking, the Walk Tour costs P950.00 and it includes a heavy merienda from La Cocina De Tita Moning. Ivan served Fresh Kangkong Salad, Chicken Galantina, Arroz Valenciana and Caramelized Pudding that afternoon with refreshing Tanglad Tea. And yes, we each had a shot of San Miguel Beer!!! Wow, that is not a bad price considering the place.... thanks for visiting one of my sites..
tol, dahil sa mga pics mo ay nanumbalik sa akin ang mga memories ko nung diyan pa ako sa malacañang nagtratrabaho. halos araw-araw ako nandiyan sa mga lugar na kuha mo pero hinde ko siya masyado pinapansin nung araw dahil nga common kong nakikita. You always take me to the most interesting places with the most beautiful scenery and artwork...well done! buti pa ikaw nakapasok na sa malacañang. tapos nkita mo pa most powerful person in the pinas. thanks sa pictures, you just brought me there. Those interior shots blow me away. wow...so lucky of you to meet ivan AND GMA in person! congrats! I've never been inside a palace so all of this is fascinating. Travel buddy mo pala si Dong! So that's why. This sounds like something we would enjoy.